Domestic Moose: Back to basics for me? One of my goals this year is to design and build a sampler quilt. As such, I figure it's a great time to put together some blocks I've always wanted to make. Last night, I pulled out the stash and started putting things together. First up? A block I've always wanted to make, but definitely not make an entire quilt out of - The bearspaw. Bear's Paw? This is what I ended up with. Looks great right? Look at those points - while ironing each individual paw, I was so excited by how great they looked. How perfect they all were. 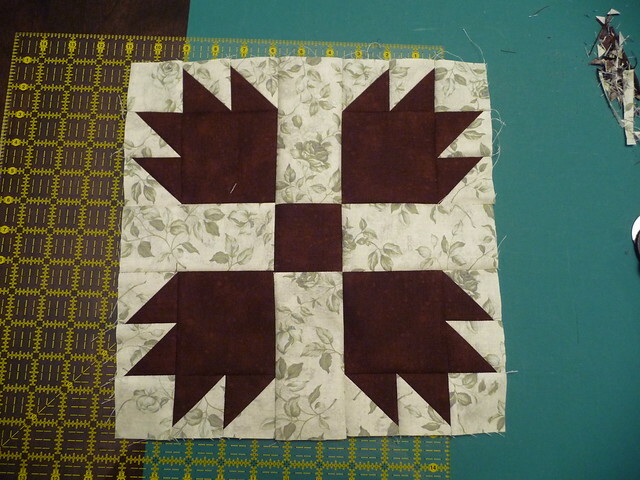 Yet, when I got the block sewed together, it didn't measure the proper 12.5". Confession: I knew this before I sewed it up. Now, I should start by saying when I trimmed the half square triangles, they were all exactly the right size (2 1/8"). But when putting them together, I quickly realized that one of the paws was about 1/4 inch smaller than the rest. I'm still not sure how that happened, but it was late and i just wanted to finish it, so I put it all together anyway. Not the right answer. The most important part of quilting is accuracy. 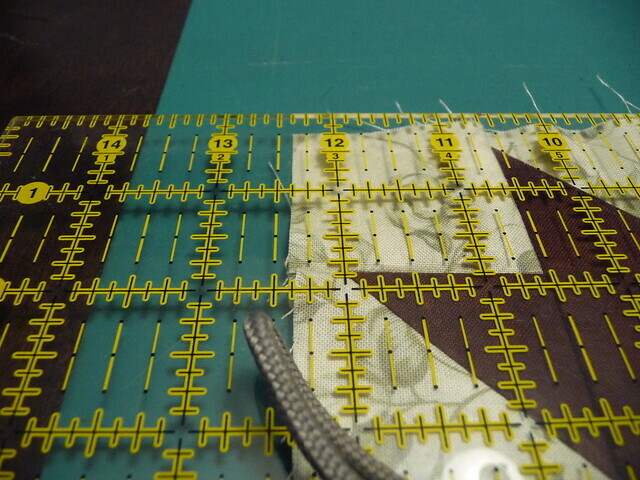 If you don't get the 1/4" seam, you're going to struggle with the entire block and quilt. It's just not pretty. With my first block yesterday (Ribbon Star from Fresh Lemon's Solstice Stars), I payed close attention to my seams and even measured after sewing up the first batch. I even own the 1/4" seam foot for my sewing machine! Should be easy, right? Wrong. Turns out, my machine's 1/4" seam line should be a thread inside of the mark on the foot. Who knew! Big deal right? Wrong. At the end of the block, that could add up to 1/8" or even a 1/4" off! 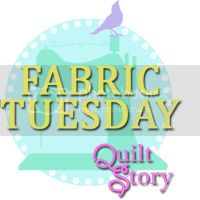 So the first thing you need to do when quilting is find out where your 1/4" seam allowance is on your sewing machine. Learn it. Mark it. I've used masking tape to create a more permanent line in the past. I've marked my bobbin cover plate with a sharpie. I've done lots of things before I picked up the foot. And now I know where, exactly on my foot I should be targeting. 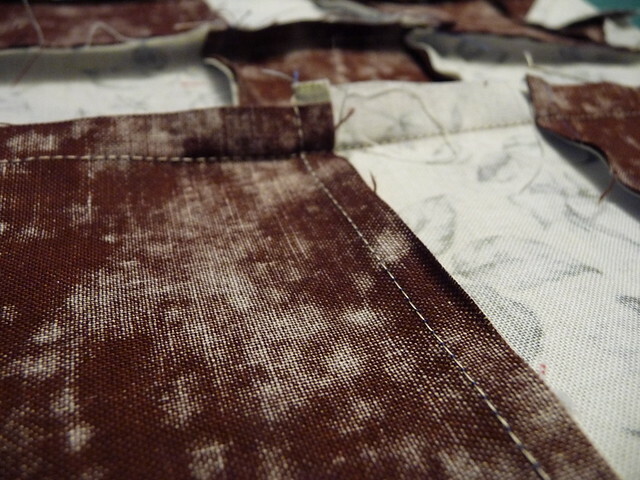 The bottom right to centre of this photo shows a good 1/4" seam. It's nice, it's straight, it's a quarter inch. Second thing, when it's late and you just want to finish the block, consider walking away and finishing another day. Because you might be ok with just pretending you don't have a size issue. And you might do something stupid like try to make it work. 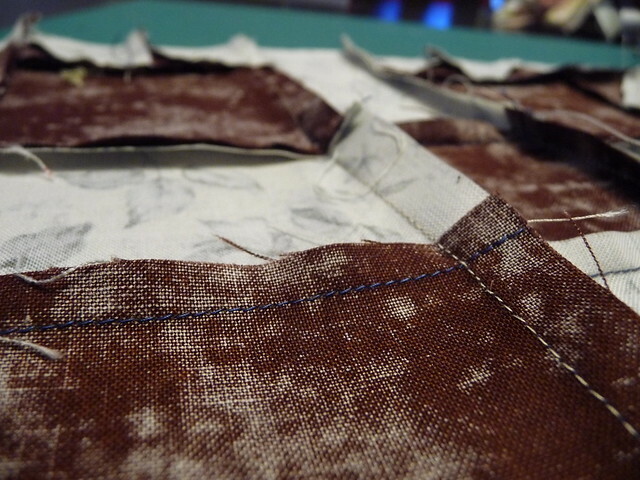 And you might end up with a seam like this. The light area in the centre right? How big do you think that seam is? 3/8ths? Maybe even a full half? Is it any wonder my block is wonky and the wrong size? I think not. Where'd I put my seam ripper?